Getting your project running with many channels to deal with. In this article we'll discuss how to connect and manage many Phidget channels in your program. Given that every channel of every Phidget is its own software object, it can be daunting to try to figure out how to organize them all. 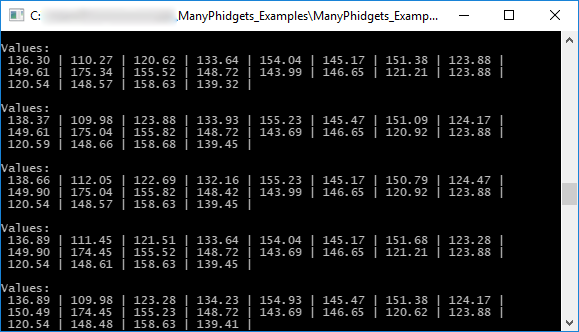 This guide should help you find ways to organize Phidgets within your own programs. How to deal with all these sensors? For this setup, we used twenty 1142 light sensors. 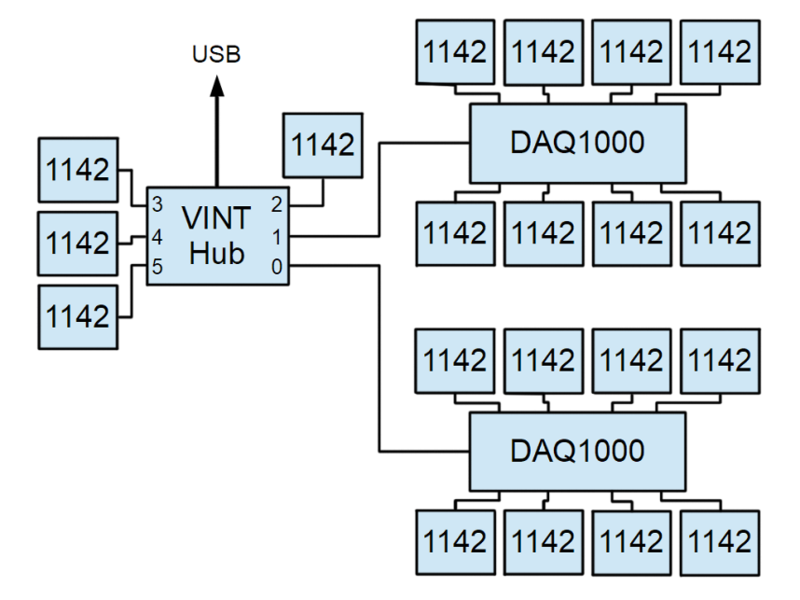 We connected some directly to a HUB0000_0 VINT Hub, and others through DAQ1000 8x Voltage Input Phidgets. With the specifics of our setup covered, now we can dive into effective techniques to organize these Phidgets in software. While the code we will be describing is written using the C language, most of the concepts covered are still applicable for use in Java and Python as well. To start, we created a structure to keep track of the pertinent addressing information for each channel. This includes the device serial number, hub port and channel for each sensor, as well as whether or not the sensor should use the Voltage Input on the hub port itself. We then made an array of such entries, which serves as a reference to keep track of all of our channels in one place. 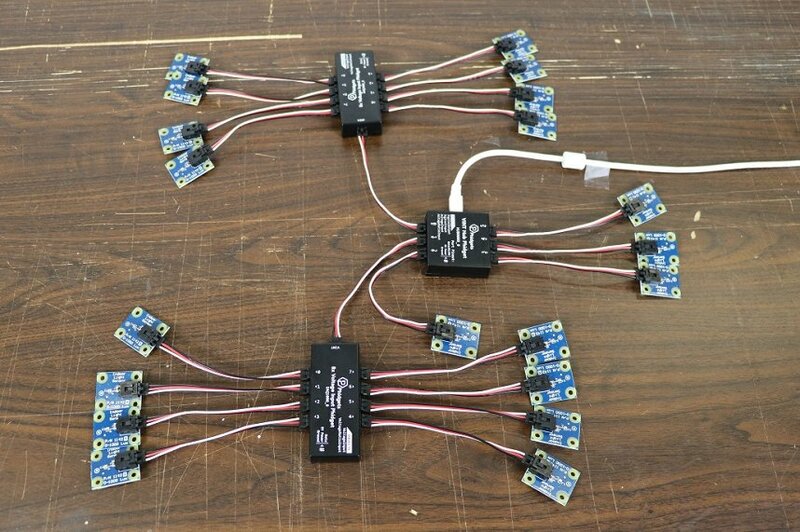 Knowing this array, we can use the index of the channels within this array to serve as a unique identifier to keep track of each sensor more easily. Alternatively, you could add your own unique identifier to the parent structure and use that to identify your Phidgets. For each of these entries, the serial number is "-1" which will match any serial number. If we wanted to map these to specific hubs, we would use the actual serial number here. Similarly, we created an array of structures to keep the important information from all the channels in one place. Now, in the main block of your program, you can create an array of Phidget handles to contain all your Phidgets of the same type. You may then address and open them sequentially in a loop. * Open the channel synchronously: waiting a maximum of 5 seconds. We set up all the classes with the same event handlers for simplicity. In this case we also used the context (ctx) pointer to pass our supplementary channel info to the event to keep that information linked to the channel when it fires events. We used the attach handler to initialize each Voltage Input channel to use the 1142 sensor type to match the sensor attached to each input. At the top of the handler, you can see how we extract the supplementary channel information out of the context pointer we gave each event handler. Here we're using it to get our unique index for the channel that fired the event. Next, we used the sensor change and error handlers together to track the values coming in from all the sensors. Once data has been collected on all channels, the new values are printed onscreen. The above is intended as a starting point to getting a large number of Phidgets working in your project.